Would You Try It With a Fox? I love reading to my 3 year old son. One of our favorites is Green Eggs and Ham by Dr. Seuss (another great book is I Had Trouble in Getting to Solla Sollew- you think YOU have problems? But that’s another post for another time…). Dr. Seuss has a brilliant knack for illustrating life’s great lessons in his books, so I get as much from the books as my son does. You’re probably familiar with the story of Green Eggs and Ham, but just in case, it’s the story of one (unnamed) character trying earnestly to get the character Sam to try green eggs and ham. They go through a maddening number of potential scenarios, all in the name of convincing Sam to just try the green eggs and ham. He doesn’t want them in a box, with a fox, in a house or with a mouse… That Sam is stubborn! Social Media With A Mouse? A lot of people are still saying no to social media. Last night while reading the story, it occurred to me that many small business decision-makers are like Sam- saying no to social media, without even being sure why. Yet they blindly support tactics like blanketing local zip codes with direct mail pieces (argh). I feel like the other guy in the story- will you try social media if I give you some great case studies? Will you embrace Twitter if I can show you ROI? Could I get you to reply to the people who like you and your company on Facebook if we can demonstrate that it strengthens your brand recognition? Why are you being soooo stubborn? 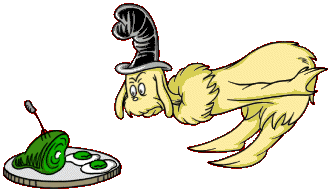 There isn’t any back story in Green Eggs and Ham- we don’t know why the first character is so adamant about getting Sam to eat the green eggs and ham, or why Sam has an aversion to the dish, but the point is that we often say “no” to lots of things without a good evaluation. Sometimes it’s a knee jerk reaction because we’re creatures of habit; we tend to do things the way we’ve always done them. At other times we say no out of fear of the unknown. The funny thing is that in the end of the book, Sam is finally worn down, caves in and tries green eggs and ham. And guess what? He LOVES them. Jay Baer has said on this very blog that he believes every company will have a social component within 2 years, and Amber Naslund has written persuasively about the dangers of requiring case study “proof” before getting involved. And that’s just it. For small business, the costs of social involvement are dwafted by the potential benefit, yet the psychology of stubbornness remains.